When generators are operating in parallel with the grid (utility) it is important to detect that the grid supply is present. With the grid connected the system frequency is very stable, but if there is an interruption of the grid, a frequency deviation will occur and this will be detected by the Frequency Deviation Relay T3500. 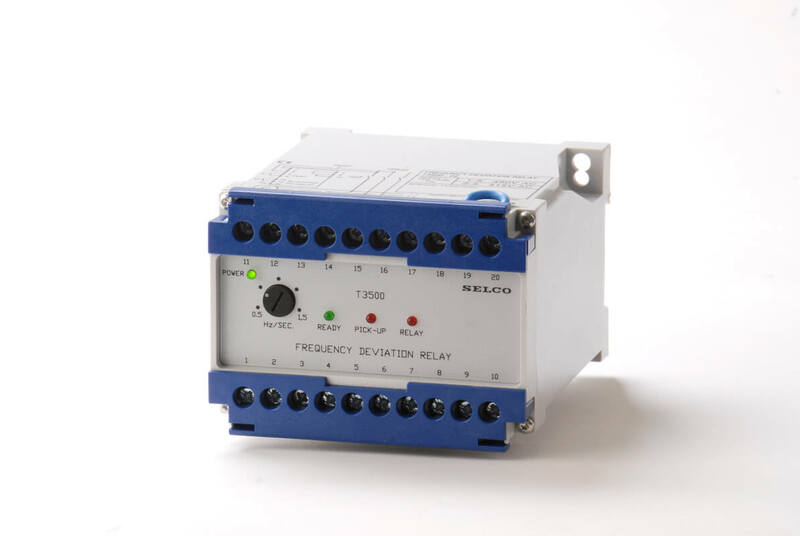 The T3500 Frequency Deviation Relay will, based on a simple AC voltage measurement, monitor the change in frequency over a time period of one second. The T3500 Pick up LED will ignite as soon as the voltage frequency has changed more than 0.5 Hz to 1.5 Hz per second, while the internal relay (and the relay indication LED) activates after the frequency deviation has existed for more than 100 milliseconds. The 100 millisecond delay can be omitted by bridging two external connection terminals. An alternative delay of 50 milliseconds can be obtained by inserting a resistor between the two terminals. The Pick Up and Relay LED will ignite simultaneously if the delay is omitted.